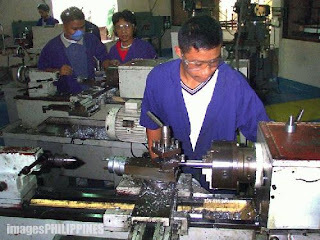 Press Machine Operation NC I is a short TESDA course in the Philippines that will help you and train you in operating mechanical press to bend, notch, punch, draw and trim sheet metal. This short course falls under the main course: Mechanical Engineering but is trimmed down to be a short course to be able to offer to people who wanted to finish such course in a short span of time. If you really are an aspiring Press Machine Operator, here are some Job skills and requirements you may take into consideration. Math Skills: Punch press operators may need to have good math skills or develop it first because this will help them understand complex instruction, how schematics work and make sure items are designed and built correctly. Problem Solving Skills: Of course, Punch press operators will need to be aware of why machines are not at peak performance, how to increase output and how to fix some errors. Attention to Detail: Punch presses are precision equipment. Being off by millimeters could be a critical error. Keen attention to detail is required. Stamina: Punch press operators often work long hours doing repetitive movements so they may need to work on their stamina. Punch press operation is not an easy job, though it is manageable, still, operators need to have enough strength as this requires mental capability. Press Machine Operation NC I takes up to a minimum of atleast 294 hours to complete. Qualified Graduates of Press Machine Operation NC I can find employment as a Press Worker. Students enrolled in this short course may be required to undergo a competency assessment before graduation. Note: this is not mandatory, ths is based on the decision of whoever handles the credentials. You can take this at any of the TESDA-Accredited Assessment Centers for Press Machine Operation NC I that are listed on the site. A National Certificate (NC I) will be issued to those who will pass this assessment process. You can find more information on assessments and certification if you go to your nearest TESDA institution or visit the official website of TESDA.